Our UPS went down and the phone system at my organization seem to have malfunctioned for two weeks now. Up until today, all efforts to restore normal operations are futile. I am uncertain how to correct this issue. I contacted our ISP here and they are unable to resolve the issue as well. Help PLEASE!!! It would appear that everything was powered down due to the UPS failure. From experience, my guess is that your telephony services aren't synced up correctly. The best thing to do here is to established that the call server is up and running, which I think is probably the case. 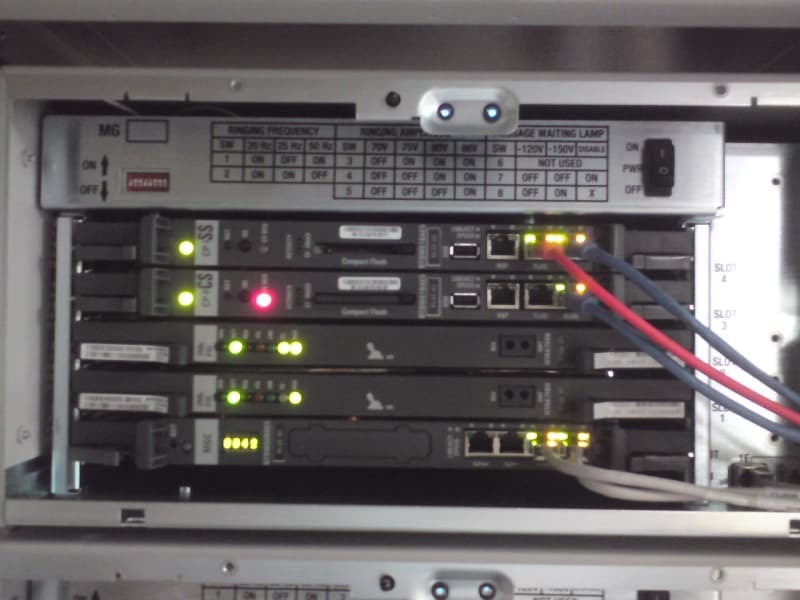 Then reset the signalling server so that it links up correctly with the Call Server. Finally, you might have to reset any of the media cards. Don't take my advice as the "must do" option as you really need to find out the status of the servers and cards etc and usually taking off any covers will show you the LED status on the Media cards. 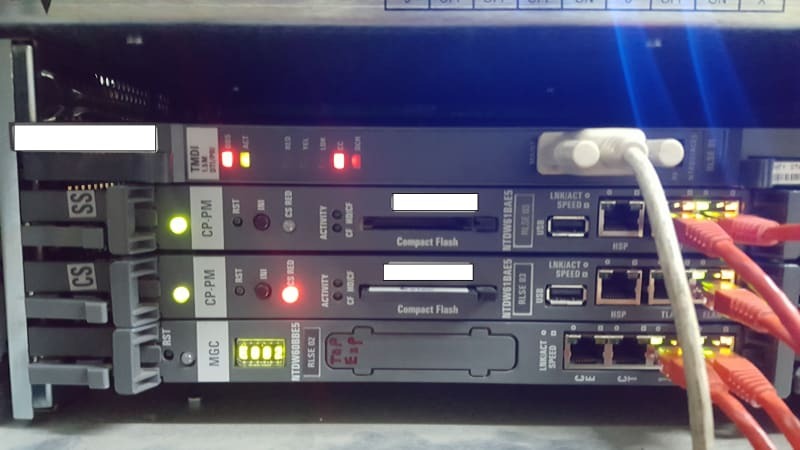 The problems you have were most likely caused when the kit booted up and some of the equipment was back on line before the main Call Server was operational. The same applies with you have any Contact Centre / Voicemail servers as they would link to the wrong ELAN. Hold on, I have just seen the photo. Have you got another cabinet with CPPM cards in it?. Your (SS) Sig Server looks to be on line, but the main (CS) Call Server Isn't. The HSP bottom light is red, which suggests that it's normal if it's not a dual processor. You should have a Green LED at the top. I can't see the LED status of the MGC card. The MGC card has the E002 displaying on it. It is hard to display due to the camera quality. No, there is no other cabinet. 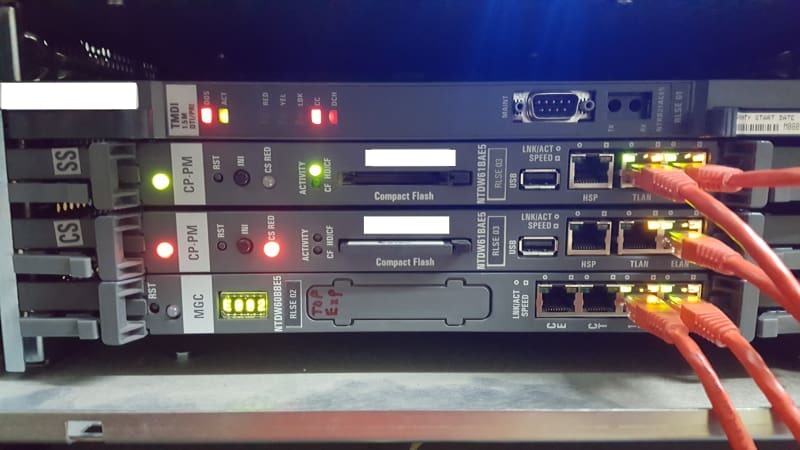 Is the top light on the CPPM callserver RED, ORANGE or GREEN now, looks red or orange in the picture? If its still red/orange get a serial cable plugged into it and see whats going on, also get the compact flash pulled out of the CPPM in case that contains you latest backup as you wouldn't want to loose that. Yep, Call Server appears to be down. You might have to start off by doing a reset the CS card. As suggested above, remove the Compact Flash card and even consider copying the contents on another computer in case of any disaster happening. If you don't have any login details when trying to access it via the serial port, then you may have to take a risk and just pull the CS CPPM card out for a minute or two. This is something I would not normally recommend, but I have heard from other engineers who have done it as I'm sure the CPPM doesn't have a reset button. The CPPM does in fact have a RST Button which is basically the SYSLOAD. It also has an INI button. Good news. I changed the RAM in the Call Server and one of the lights are now green. However, the error (E002) is still being displayed on the MGC card. Any suggestions? I'm fairly certain that you need to reset that card. Is there a small reset button at the top? No, I am not seeing on at the top. Just the one there on the right (in the picture RST). Also, why is there a cable plugged into that TMDI Card? Reset the MGC card and the p`hones are back up. Thank you for your assistance. I will contact our service provider regarding sending out calls. Internal calls are going through but no luck with outside calls. Thanks again. I'm glad that you got it running again. Could that be the issue why I am unable to send or receive calls? All I am getting is a busy tone when I try dialing out or when calls are coming in. The service provider told us that they are able to get to the line from their end but they are unable to get to the system. The error is now gone and there are four zeros (one is small) displaying on the MGC card.